Kit Harington makes a quick dash out of his hotel on Tuesday night (April 2) in New York City. 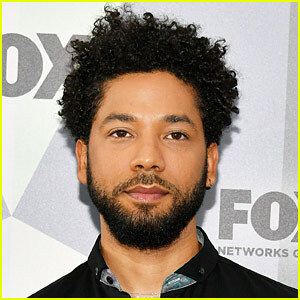 The 32-year-old actor kept things cool in an all black outfit as he headed out to meet up with his Game of Thrones cast mates for dinner at Marea restaurant. Other cast mates at the dinner included Peter Dinklage, Natalie Dormer, Maisie Williams, Carice van Houten, and Sibel Kekilli along with author George R.R. Martin. Earlier in the day, fellow cast members and Sophie Turner and Sean Bean were spotted running around the city as they promoted the upcoming final season of their hit HBO series. The final season of Game of Thrones is set to premiere on Sunday, April 14 at 9pm ET on HBO. Make sure to tune in! FYI: Kit is wearing a Cotton Citizen tee and jeans. 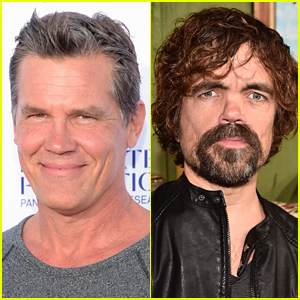 Josh Brolin & Peter Dinklage to Play 'Brothers' in New Movie! Josh Brolin and Peter Dinklage are teaming up for the upcoming movie Brothers! Not much is known yet about the film’s story, but the two actors will be playing unlikely brothers, according to THR. The movie is said to have a similar tone to the 1988 comedy Twins starring Arnold Schwarzenegger and Danny DeVito. Tropic Thunder and Get Hard‘s Etan Cohen is writing the script for the film while Josh and Peter are both on board as producers. There are 14 new photos from the final season of Game of Thrones! 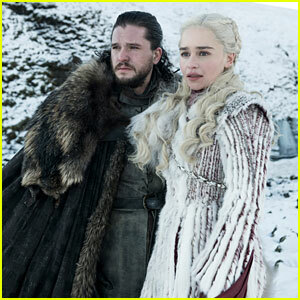 The pics feature Kit Harington as Jon Snow, Emilia Clarke as Daenerys Targaryen, Sophie Turner as Sansa Stark, Lena Headey as Cersei Lannister, Peter Dinklage as Tyrion Lannister, Maisie Williams as Arya Stark, John Bradley as Samwell Tarly, Nikolaj Coster-Waldau as Jaime Lannister, Conleth Hill as Varys, Isaac Hempstead Wright as Bran Stark, Liam Cunningham as Davos Seaworth, and Gwendoline Christie as Brienne of Tarth. The season 8 premiere is set to kick off on Sunday (April 14) on HBO. Be sure to check it out! 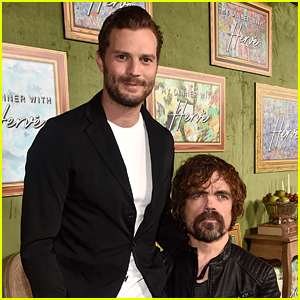 Peter Dinklage made an appearance on The Late Show with Stephen Colbert on Wednesday (October 17) and he spoke about his My Dinner With Hervé co-star Jamie Dornan. In the interview, Peter expressed that he helped Jamie learn some lines for the reshoots of Fifty Shades Freed. Emilia Clarke Supports Peter Dinklage at 'My Dinner with Herve' Premiere! Emilia Clarke walks the red carpet at the premiere of the new HBO movie My Dinner With Herve on Thursday night (October 4) at Paramount Studios in Los Angeles. 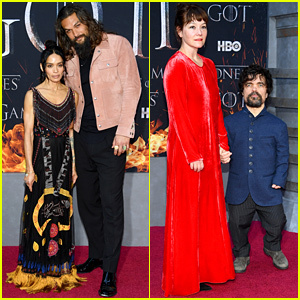 The 31-year-old actress was at the event to support her Game of Thrones co-star Peter Dinklage, who stars in the new movie alongside Jamie Dornan. Last week, Emilia debuted her brand new haircut and revealed the fun inspiration behind the pixie cut.